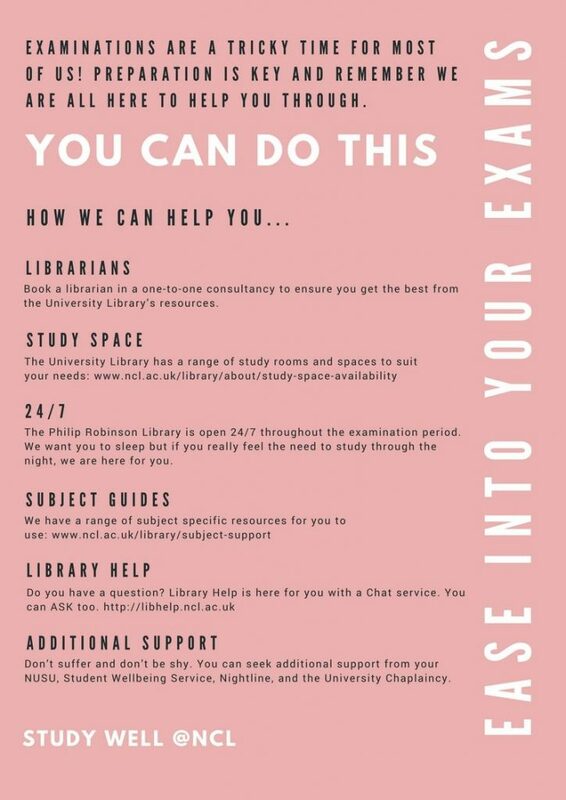 Study Well@NCL – What we’re doing in the Walton Library. 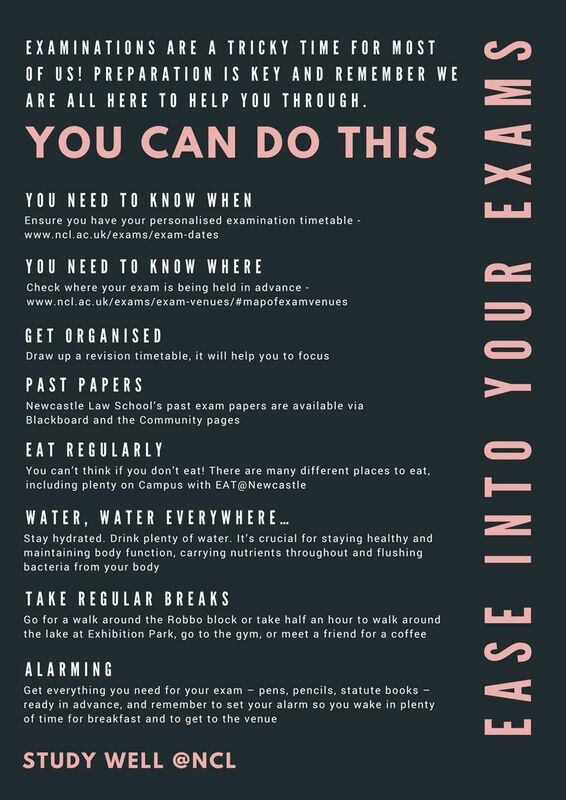 As you may have already seen Study Well@NCL advocates a responsible approach to studying and encourages positive behaviours in study spaces because we know it can be stressful especially at certain times of the year. Here in the Walton Library from 7th-25th January 2019 we’ll be extending our opening hours opening from 8:30 until midnight, seven days a week. You can check our extended opening times on the library website. We’ll also be monitoring our Noise Alert phone very closely during this time. Wherever you are in the Walton, you can text us at 07891 484764 and we’ll investigate the source of the noise issue as soon as possible. that walkways are kept clear. Choose a study space suited to your preferred choice of study, we have silent, quiet and collaborative spaces to chose from. Do be mindful of the food and drink policy within your chosen study area. We might not always know straightaway if there’s a shortage of towels in the bathroom or if a bin in a group study room needs emptying. Just give us a quick heads up if you notice something that needs our attention and we’ll be right on it. We encourage all Library users to take regular study breaks. Taking the time to get a drink of water or some fresh air can make all the difference to your study session. However, to be fair to all Library users, we’re asking that breaks away from your study space are no more than 30 minutes. On a much lighter note, we’ll be providing pens, pencils and special medical-themed colouring sheets for you to relax and unwind with. Studies have shown that colouring can reduce anxiety and depressive symptoms in adults. So while you’re taking a study break, why not pause and Colour Your Campus? Even better, hand your completed sheet in to a member of Library staff with your name or Twitter handle on the back and we’ll enter it into a draw to win some fabulous Library prizes. We hope that Study Well@NCL provides you with a peaceful and productive study environment and allows you to achieve maximum studying satisfaction. We welcome feedback on how we can change or improve Study Well@NCL. You can Tell Us What You Think’ online or get a form in the Walton Library. Finally, if you’re feeling overwhelmed, please contact the University Student Wellbeing Team or NUSU Student Welfare. They’re there to help. We wish you every success with your exams – Study well. Flett, J., Lie, C., Riordan, B., Thompson, L., Conner, T. and Hayne, H. (2017). Sharpen Your Pencils: Preliminary Evidence that Adult Coloring Reduces Depressive Symptoms and Anxiety. Creativity Research Journal, 29(4), pp.409-416. Selig, M. (2019). 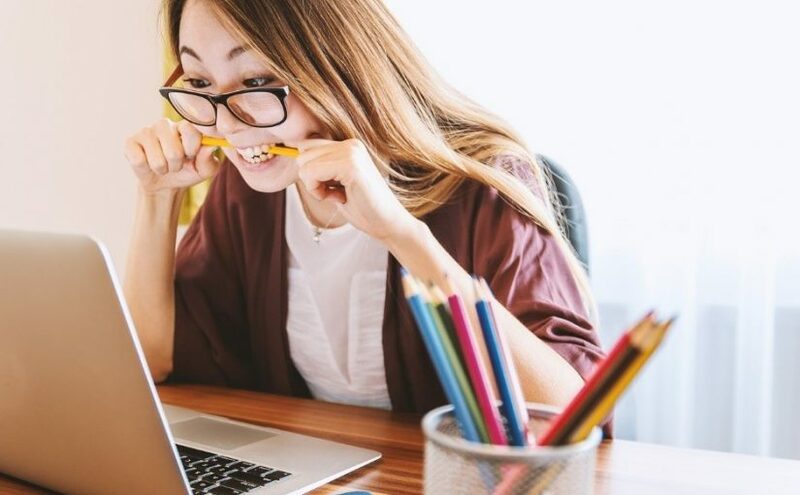 How Do Work Breaks Help Your Brain? 5 Surprising Answers. [online] Psychology Today. Available at: https://www.psychologytoday.com/gb/blog/changepower/201704/how-do-work-breaks-help-your-brain-5-surprising-answers [Accessed 2 Jan. 2019]. Posted on 9th January 2019 8th January 2019 Author MarianCategories Study Well @NCL, UncategorisedTags Biomedical Sciences, Dentistry, Medicine, Nutrition, Pharmacy, Psychology, Sport and exercise scienceLeave a comment on Study Well@NCL – What we’re doing in the Walton Library. How about using the Academic Skills Kit (ASK) if you need support during revision. You can find it on the Academic Skills Guides and it can give you loads of useful help and tips at this stressful time.